All around us, cities are getting smarter. By 2020, the global market for smart city services will reach an estimated $400 billion a year. Learn about and participate in this major paradigm shift at the 2016 Smart City Expo World Conference, 15th – 17th November. It’s being held at the acclaimed Fira Conference Centre in the heart of beautiful Barcelona. At the heart of the smart cities revolution is a simple idea: improving urban life through the intelligent use of technology. In smart cities, this means finding innovative ways to use Information and Communication Technology and the Internet of Things. One simple example can be found in the conference’s own host city. Barcelona employs sets of smart traffic lights that turn green as emergency vehicles approach. This allows a much-improved response time for incidents such as fires. Smart technology has the potential to improve almost every aspect of urban life, including governance, sustainability, traffic management, energy efficiency, pollution, public transport, health and education. Expositions and congresses are a key method of furthering this truly revolutionary approach to city development. November 2016 marks the 6th edition of the Smart City Expo World Conference (SCEWC). It’s the premier global event for anyone with a stake in the future of urban change. The success of the conference is well-established – last year saw 421 speakers and over 14,000 visitors, from 105 countries. This year’s event will be on a similarly epic scale. At the 2016 edition, once again, over 400 speakers deliver sessions on a range of smart city issues. The conference will be host to some of the leading thinkers and practitioners within the global community. These include such luminaries as Edward Glaeser, Professor of Economics at Harvard University; Abha Joshi-Ghani, Director of Knowledge Exchange & Learning at the World Bank Institute; and Venkaiah Naidu, Union Minister for Urban Development, Government of India. When they are not learning from international thought-leaders, visitors can experience smart city life for themselves. In particular, the exhibition space will contain the 2000m2 Smart Plaza, featuring a city hall, press corner, cafe and assembly space. Interactive exhibits from Partners Solutions and the Call for Solutions initiative will be on display. Job marketplace – sector employers meet up with selected and appropriate candidates. The challenges facing tomorrow’s cities don’t exist in isolation. Instead, they link with broader issues faced by all of the population. It’s therefore, fitting that the smart city conference sits alongside three other significant events, each of which adds opportunities for synergy and cross-fertilization from which all can benefit. These also take place on 15th-17th November 2016 at the Fira Conference Centre. The Circular Economy European Summit addresses an alternative economic system that some see as an integral part of cities becoming smarter. The circular economy aims to be a more sustainable industrial economic model that works like a natural ecosystem, thus eliminating waste and pollution. Iwater, the International Integrated Water Show debates and showcases technological and innovative solutions within the water sector. It’s a key international event that examines the future of our most precious and essential global resource. Lastly, European utility week is a meeting of stakeholders in the global smart energy market. With an anticipated 12,000 attendees and 600 exhibitors, all the major players in the future of smart energy will be present. 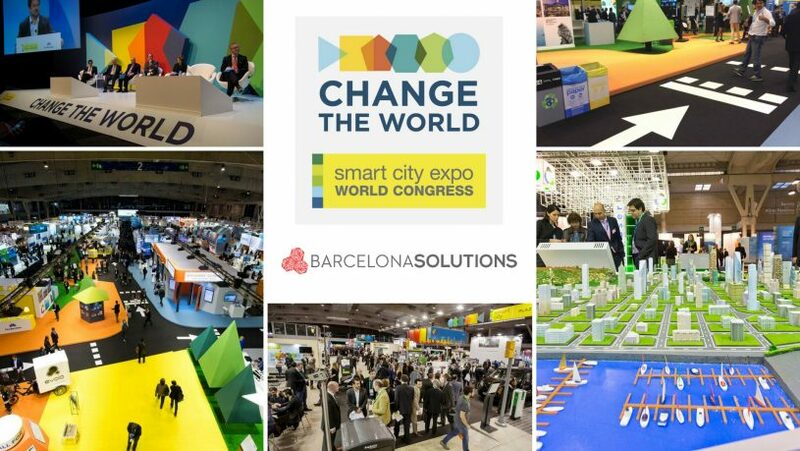 For individuals or organisation invested in the future of our cities, the 2016 SCEWC is an unmissable event. To ensure you get the most out of your visit, Barcelona Solutions offers a seamless support service for corporate travellers. We are proud to be Barcelona’s premier providers of corporate travel solutions. While you take care of your work schedule, our job is to sort out the other logistics of your visit. We find and book the best hotel for your particular needs, your airport transfer, your travel needs and anything else you might need. And ee do all this quietly and efficiently, so you don’t need to waste energy thinking about it. Get in touch to find out how we can benefit you and your company.